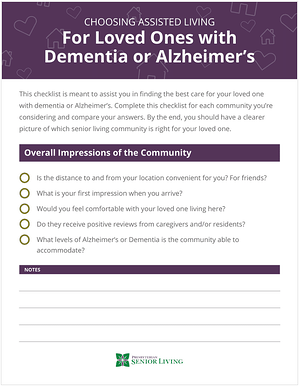 Fill out the form to get your copy of the checklist and start learning about Alzheimer's and Dementia care. This checklist outlines everything you need to know in order to choose the best senior living community for your loved one. Dementia and Alzheimer's can come with specific care requirements, and it's a good idea to make sure the new senior living community you're considering can meet those requirements. Use this checklist to find the best community for your loved one. Just fill out the form on this page to get your copy.